A very simple wallpaper tutorial. 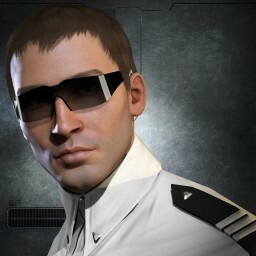 eveonline.com looks more less unchanged since the 2005: the same menu, the same dull grey colour, animated header in the middle of the table. Over the last couple of years CCP has gradually redesigned the Account Management and Feature pages, so they look much more "modern" (as they should have in the first place!). The new websites feature amazing backgrounds, which look cool and in most cases better than the official wallpapers, which can be found here. Ever wondered how to use such background as your desktop wallpaper? It is really simple. You will need a web browser (this tutorial uses Chrome), a graphics manipulation program (you don't need Photoshop for this; free GIMP 2 will do just fine - you can download it here) and some spare time. Choose the "Resources" tab and look for bg, background or anything that looks like the backdrop that you might want to save. Set it as the desktop wallpaper. You can always use the expansion logo and add it as a new layer to your wallpaper, so you get something like this. To achieve best results, set the logo layer to "Additive" blending. This makes the white color of the logo show, while the black background remains transparent. CCP often uses transparent PNGs for their logos, so it is now easier than ever. Making this kind of wallpaper takes up to 5 minutes, and the one above is in top search results for "Incursion wallpaper" on Google. Feel free to experiment with the multitude of filters available in the GIMP - they allow you to affect colors and the image itself. On the right part of the screen GIMP opens the Layers Channels and Paths window, which allows the manipulation of different layers of the image. You can duplicate the main layer, add some filters to each of the copies and then change their opacity to less than 100% so they all intermix with each other. Above you can see the result of such tinkering. Notice I have added a layer mask to one of the layers - layer mask makes parts of the layer visible, and parts hidden. To make a smooth transition I have used a black-to-white gradient as the mask (black hides the layer, while white shows the layer). This way the left part of the screen is gray and desaturated, while the left part is vivid. Download the GIMP image here. clicking on the "eye" icon will hide a layer. This way you can see how the image was created - layer by layer. CCP is usually helpful towards creative minds and released this Fan Site Kit, which contains even more backgrounds, logos and icons, which you can use for your custom wallpapers. Thanks for hint @Irumani! Remember! If you publish your wallpapers on the internet, always put credits where credits are due, and copyright information where it is necessary!